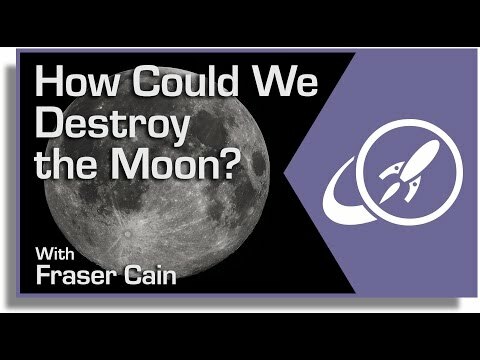 What would it take to destroy our moon, and eliminate the enemy of stellar astronomy for all time? What about antimatter? You wouldn’t need an entire moon’s worth to create a big enough explosion to destroy the moon. Still a lot though. And then you have to store it and aim it at the moon. But if you’ve figured out how to make that much, the rest should be easy. elvigy you’d need at least ~1 billion tons of antimatter, then fire it (somehow) into the Moon’s Core. To destroy the Earth, in Greg Bear’s “Forge of God”, aliens use two opposed chunks of neutronium/anti-neutronium that slowly spiral together inside the Earth, since they’re too dense to react (much) with normal matter. The “dense” interior of the Earth slowly slows the chunks into mutual collision. A similar trick could be done with the Moon – two separate billion-ton chunks of quark & anti-quark matter are then required, as neutronium is unstable except inside neutron stars. It used to be, “Let’s all go to the Moon…” Now it’s, “Let’s blow up the moon!” Say what? Are you upset about not being able to walk on the moon in your generation? SO AM I! Push the button! Why would we want to blow up the Moon? Yeah, let’s blow up Pluto. To make the Earth a more perfect sphere, once we’ve paved the entire surface, for maximally-ideal driving conditions in our Mach 6 Hypercars. Anyway, we could just set up a momentum transfer system using repeated passes by smaller solar system bodies like asteroids. It would take a while, but it would be no problem to crash the Moon into the Earth or fling it out of orbit. It’s blocking my view of Mercury; It has to go. Oh, and it might get rid of that Secret Alien Moon Base that nobody is supposed to know about… Oops… Nevermind! I didn’t write that… I was never here. It seems we’ve skipped a step, here. You calculated the gravitational binding energy of the Moon, but not the energy required to lower its orbit to the Roche limit. I think I’ll take a crack at it. So, in short (too late!) while gravity will do the work of actually disassembling the Moon for you, getting the Moon down to its Roche limit will cost TEN SEXTILLION times more energy than just blowing the thing up! You’ve computed the wrong value, somehow. It’s actually -1.55E+30 J. Only ~12 times the Moon’s binding energy. Of course, to cause the escape of the Moon only needs 7.62E+28 J.
You’ve used 6.674E+11 as G instead of 6.674E-11. And my own calculation was for the difference in potential energy between altitudes, not for orbitting satellites. So it’d be just 7.75E+29 J, not 1.55E+30. My mistake. Ah, dang it. That was it. Thanks! Thrust over time and accelerate the moon out of orbit. It’s slowly heading that way anyways. Let’s just give it a nudge so that it could happen before the Sun goes into it’s Red Giant phase. It would be easier and less expensive just to put your observatory on the far side of the Moon. As a bonus, that would make the Sun much less of a bother too. And you could dispense with those expensive adaptive optics. “…observatory on the far side of the Moon…” I vote yes! Find the appropriate size and shape crater. Level the tops of the crater walls where necessary then build a REALLY big, suspended like Arecibo, radio telescope! How about… after the ISS has finished it’s primary mission. We disassemble and send the usable modules to lunar orbit? Reassemble.. resupply.. and reuse as a trans lunar way station? Might be the Russians will do that? Yeah, but at least the Martians will no longer want to buy it and build time-shares there. And think of the ore we could mine until it blows up on its own! Send 3 different Spacecraft to the Moon; One with a payload of just ‘Pure Sand’, another with a payload of just ‘Pure Aluminum Powder’. The Third Spacecraft I come back to later. Once there, there would need to be a way to combine the two payloads ands sift thoroughly, but not too much. Once the Two components are “sifted well’, divide in half, place each half into the two spacecraft and set on on the light-side and the other on the relative polar-opposite of the location of the first craft. Now set two precisely-synchronized timers on each payload and get your crew back into the Third craft to scram and wait… when the timers hit the ZERO-Mark (hopefully in sync), you have a massive “Super-Thermite” Explosion. If there’s any debris (And it seems there will be) THAT’S Another issue you can resolve with another question on another day. FYI: once the said “Moon” is gone, What would the Effects of its just not being there have upon the Earth?! –Aside from the explosion itself and the debris, the fact that the usual gravitation effects that the moon has or had on the Earth would be gone, could be a big concern.